Do you know the gat? 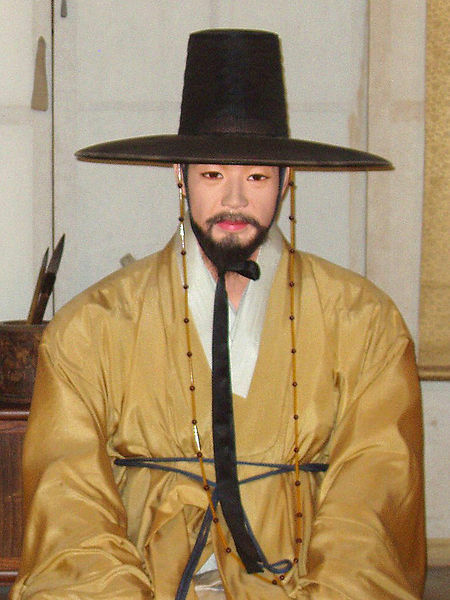 A gat 갓 is a type of Korean traditional hat worn by men along with hanbok (Korean traditional clothing) during the Joseon Dynasty. It is made from horsehair, with a bamboo frame, and is partly transparent in black color. Most gat are cylindrical in shape, with a wide brim, on a bamboo frame. Only married and middle class men during the late 19th century could wear gat, which represented their social status and protected their topknots (which were called sangtu, 상투). Under the Joseon Dynasty, black gat (heungnip, 黑笠, 흑립) were restricted to men who had passed the gwageo examination. Commoners wore a variant called paeraengi (패랭이) which was woven from split bamboo. Artisans who make gat are called gatiljang (갓일장) in Korean.